This is the last of my videos filmed during my trip to France. 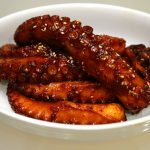 In my last video I showed how to clean and cook an octopus and serve it in the Korean style with a sesame oil dipping sauce. As I mentioned in that video, I have so many traditional Korean recipes using octopus to share. Today’s recipe is an easy one. Once you have the cooked octopus on hand you can make it in 10 minutes. It’s spicy braised octopus (Muneo-jorim: 문어조림), delicious and chewy, a little sweet, garlicky, salty and has a unique octopus flavor with a ton of umami. The more you chew it, the more flavor you get! Muneo-jorim is a great side dish for drinking, and its saltiness also goes well with rice. Koreans consider it to be a special, high quality addition to any dosirak, so f you make this for your loved ones, they’ll know you think they’re something! There are two main ways of preparing muneo-jorim. One way is to braise the head and tentacles separated but intact, and then slice them into pieces before serving. If you do it this way, you can keep everything in the fridge for up to 10 days. Whenever you want some, take it out, slice and serve. The second way to prepare it is the way I show you in this video, where we slice the octopus before cooking. When I took the train from Paris to Nice, I was hoping the cafe car would sell delicious lunchboxes. Korean trains have some really nice ones! But they didn’t have anything good. I loved the train and the scenery, and the little lamp at my table, but I really missed having some good food to enjoy it with. Coming back the other way, I set my mind to make a nice lunchbox and enjoy it on the way back. I had lots of octopus from shooting my muneo-sukhoe video so I got the idea of making a luncbbox with muneo-jorim. I bought a lunchbox container in France, which was deeper than the Korean lunchboxes I’m used to. Ours are more shallow and suitable for adding many smaller items. I had to improvise so it would hold all 7 items nicely! 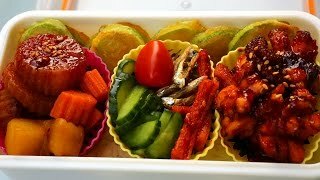 If you recreate my lunchbox, send me a photo! Yours might be more beautiful than mine! Happy cooking! Heat up a pan over medium heat with the cooking oil. Stir-fry the garlic for 30 seconds. Add water, soy sauce, and hot pepper flakes. Stir it well. Add rice syrup and stir for a few minutes until it turns a little sticky and shiny. Add the octopus and let it sizzle for 7-8 minutes over low heat, stirring occasionally, until the seasoning liquid is almost evaporated. Here’s how to make the little zucchini pancakes in my video. These are great for lunchboxes because they are easy to make and stay fresh and crispy for hours until you eat them. Sprinkle the zucchini slices with ½ teaspoon salt and mix well. Let it sit for for 5 minutes. Drain any moisture and coat each slice with starch or all purpose flour. Gently pan fry the slices, but be careful not to burn them or brown them too much. Flip them often and cook over medium heat for 2 -3 minutes. When both sides of the pancake turn light golden brown, transfer it to a plate. Serve as a side dish. Posted on Friday, January 6th, 2017 at 9:20 pm. Posted March 6th, 2017 at 12:51 am | Log in to reply. Posted February 19th, 2017 at 11:28 am | Log in to reply. Posted February 12th, 2017 at 10:17 am | Log in to reply. Hello Maangchi. I finally was able to make this recipe. This is a very quick and delicious recipe for octopus. I really enjoyed it. Thank you for sharing your great dishes with us. Posted January 22nd, 2017 at 2:21 am | Log in to reply. Posted January 15th, 2017 at 3:12 pm | Log in to reply. Posted January 14th, 2017 at 2:12 am | Log in to reply. Wow Maangchi, that lunch looks great! I imagine the other passengers wish they had such tasty food!! I really enjoy octopus. I had it in Mexico once- it was cooked with wine, butter, olive oil, garlic and spicy red pepper- delicious! And it was so tender too. I’ll have to try the Korean version! Posted January 8th, 2017 at 10:31 pm | Log in to reply. What a wonderful dish, Maangchi! What a beautiful lunch, too! Can you please make all my lunches??? Wow! Posted January 7th, 2017 at 12:37 am | Log in to reply. OMG Look how beautiful you are looking! ;-) The food was wonderful to see too… nice lunch box. I just love all the side dishes in Korean meals. This recipe was originally posted on January 6, 2017 at 9:20 pm by Maangchi. The video was watched 302,045 times on YouTube & has 7,431 likes!